In his Booker-shortlisted novel His Bloody Project, Macrae Burnet styled himself as an amateur historian, publishing a first-person account written by a young man found guilty of a brutal triple murder, that he discovered while researching his family tree. A similar elaborate and thoroughly enticing set-up opens The Accident on the A35. Macrae Burnet poses as a translator for the manuscript of the late author Raymond Burnet, who decreed his second novel should only be published after his mother's death. Thus begging the question: what in a book could be so shocking or upsetting that his mother could never have knowledge of it? The narrative is split between two main characters: teenage Raymond Burnet and Georges Gorski, the chief inspector of sleepy Saint-Louis, a French town so lacking in crime that people question the need for a chief inspector. The pair are kindred spirits, socially awkward and hyper conscious of how they imagine others perceive them. There are delightful moments of humour as they try to orchestrate a certain portrayal of themselves. However the novel is also streaked with pathos, as we see the passion or ambition of youth contrasted against acceptance of a mundane middle-aged life. 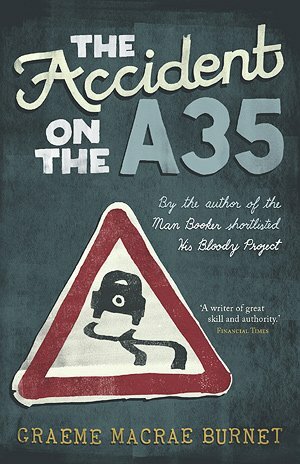 The novel follows Gorski's investigation of the accident that happened on the A35 and Raymond's own investigation of his father's life, but it isn't built around the usual pace of a police procedural. Macrae Burnet revels in the banality of small-town life as he circles around an increasingly intriguing case and Gorski comes up against nosy neighbours, self important housekeepers and gossiping hairdressers. This measured touch is expertly balanced against the low level subterfuge within the town's population and some moments of high drama and revelation that peak as quickly as they happen. An expertly paced novel of small-town characters with big-city intrigue.